Students from Macmillan Academy and Archibald Primary School this year paid their respects to all those who have died in conflict and war through the creation of a special drama and documentary style film. Our film was then shown to in excess of 2000 students and 300 staff across the two school sites on Thursday the 8th and Friday the 9th of November. This year the staff and students travelled to Birmingham to film a number of sequences in a World War One authentic trench. 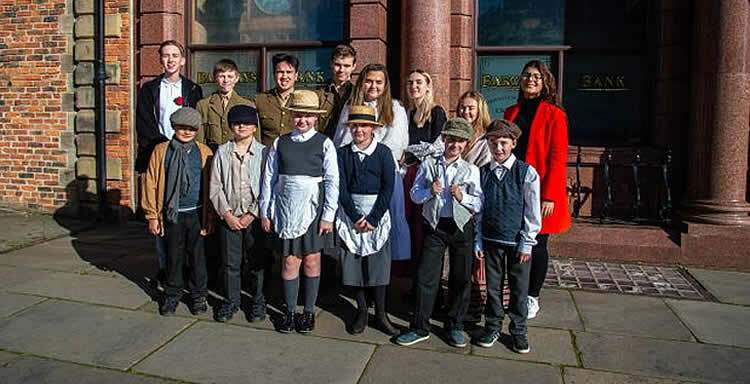 Students from Archibald Primary also joined the production team for a further days filming at Beamish to conclude the story adding aspects of drama linked to life on the Home Front. The annual Remembrance Day broadcast was streamed to every classroom and played in a special commemorative event. This was a great way of helping our students understand the importance of Remembrance so that the sacrifices are never forgotten. Both ourselves and Macmillan Academy would like to take this opportunity to thank all those involved in this year's production. With an extended and special thanks to Tudor Grange Academy Kinghurst for allowing us to film in their WW1 trench and Beamish Museum for both expanding our young people's learning linked to WW1, whilst also creating a stunning backdrop for scenes linked to the Home Front.